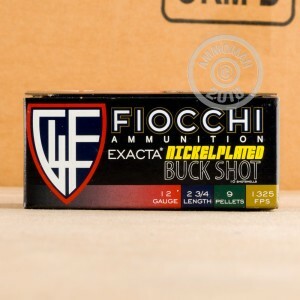 This 12 Gauge shotshell by Fiocchi is loaded with nine pellets of 00 buckshot. The .33” diameter pellets feature nickel plating, which considerably hardens them in addition to reducing their friction. As the result they will resist deformation in the barrel to provide an exceptionally tight pattern, as well as transmit a great deal of energy on impact to create an absolutely devastating wound channel. 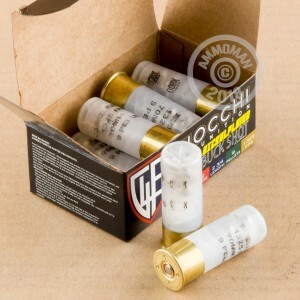 In conjunction with its 1,325 fps muzzle velocity, this is a shell you can count on for effective hunting in wooded areas as well as personal defense. Just mind your aim while implementing this shell for home defense -- it will go through walls as though they were made out of rice crackers. Fiocchi Munizioni was founded by Giulio Fiocchi in 1876 and is owned by his family to this day. They’ve mastered their craft during their nearly one and a half centuries in business, and this shell’s sturdy hull, sensitive primer, even spreading wad, and clean burning propellant all soundly reflect it. Works great in semi auto shotguns! I use these in a Saiga-12, Beretta A200, and a Charles Daley Tactical (Benelli-style copy). I have used them off and on for over ten years...they function well.